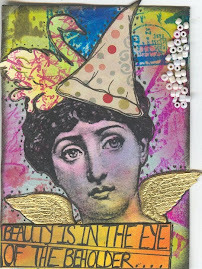 Lisa sparkle and stamps: WOYWW- What's on your workdesk Wednesday- AGAIN!!!!! 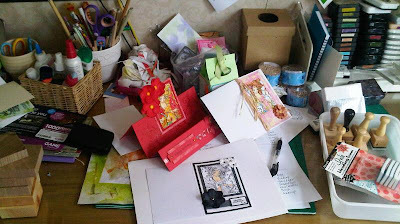 WOYWW- What's on your workdesk Wednesday- AGAIN!!!!! Wednesday again!!!! Who stole the last 7 days??? Come on, own up!!!! Well, here's what's on my desk this morning- prepare yourself, it's not pretty!!!! 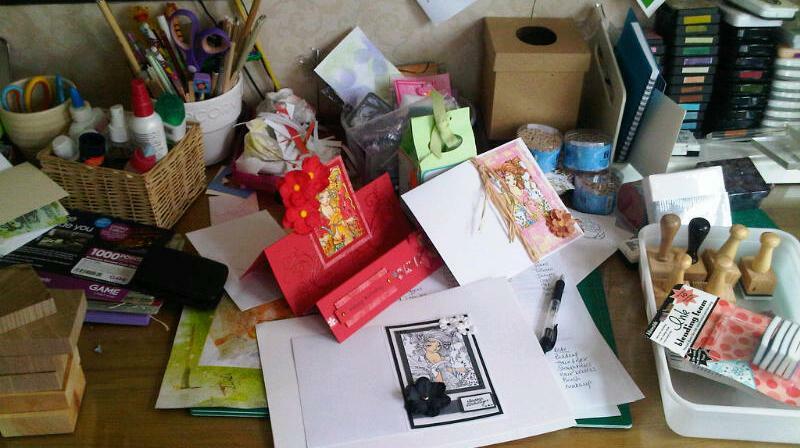 There are some cards I've finished and should put away before they get ruined. Bottom left is some square of wood my husband has cut for me to mount a stamp or two on, and on the right is the tub I've found to house the ink blending tools he made last week. There's also a tissue box I'm planning to alter. In all honesty I haven't spent much time at my desk this week. I'm not feeling 100%, so I've retreated to the safe world of Promarkers and stamped images, and I've been colouring on a little table in front of the TV. I've just not felt up to anything more adventurous or taxing, and it's always helpful to have a stock of images to make cards with. So here's my temporary workdesk. Lots of pots and tins of Promarkers (do you think I have too many???) I plan on having them all in Lyle's treacle and golden syrup pots, but we're not eating it quickly enough, so I've had to improvise with plastic tubs in the meantime. I will be able to break the colour families down more specifically, so it'll be easier to grab the pot and find the pen I need. I've got some nice images to colour.. Love the frog especially- that's one of Kay's stamps, and I must stamp him up a few more times when I visit her next! 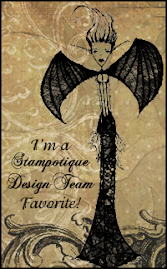 It's lovely having friends with stamp collections, it's like a huge extension of my stamps!!!! Isn't it gorgeous. 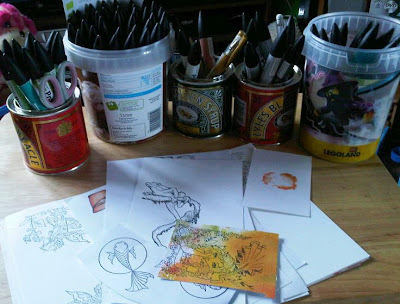 Lots of room to buy more stamps, and I've managed to fit in my punches and brayers as well. The boxes all pull out and are A4 sized, so there's a LOT of stamps in there........ I'd love to have them on shelves on display, but I think I'd need all the walls in the house!! Righto, if you fancy a nose at some more desks, head over to Julia's blog for a lovely long list of wonderful crafty desks. Bliss! OMG I LURVE your storage!! Its fantastic!! Totally jealous! Wow wow wow what fab storage unit you have there. Ooh you lucky thing having such a fab stamp storage stack!! 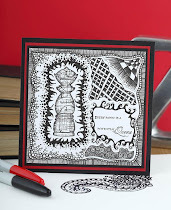 Love the stepper card on your desk! My Husband made the stamp storage. Aren't I a lucky girl? Love the stamp storage. Hope you are feeling better soon. Oh how I love cubbyhole storage - and man, that works so well! great idea. And no, I don't think you have too many PMs..is there such a thing? Hurry back to 100% won't you. That stamp storage unit is gorgeous. I would have enough stamps to fill up one bin and have room left over. Looks like you make good use of those Promarkers, too. Nice storage solution for them. Have a great WOYWW and thanks for letting me snoop. Wow what a fab storage system. Also love the syrup and treacle pots for the pens. Hope you feel better soon. Please tell where you got that unit! You're right, it's gorgeous! I like your pens etc in thos plastic tubs - and a good excuse to eat cakes, me thinks!! 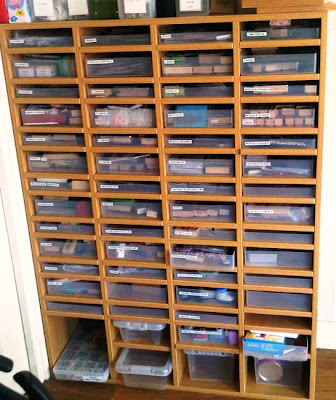 Go on ... keep rubbing my nose in your fabulous stamp storage .... then sit there and smirk as I electrocute myself drooling on my key board with stamp storage envy!!! So much crafty stuff and fab storage. Hubby is one special guy - you're a lucky girl!!! I think I am in love with your stamp storage too! fabulous! looking forward to seeing your altered tissue box, can I ask where did you get it blank from??? Fab idea to keep the promarkers in syrup tins too. No, you do not have too many inks. NEVER! I hope you feel better soon. & I agree with everyone - your storage is fab. What fantastic stamp storage - it's brilliant! thats a lot of stamp storage, I have all mine of the blocks as I use rock a blocks so much easier for me. Sorry I'm a bit late but I will get to everyone eventually. oh you can show off that storage case any day...I am sure we are all green with envy LOL! Fabulous, did you have it made? Hope you dont mind me saying ...store your ink pads upside down as it keeps the ink at the top of the pad ready to use.